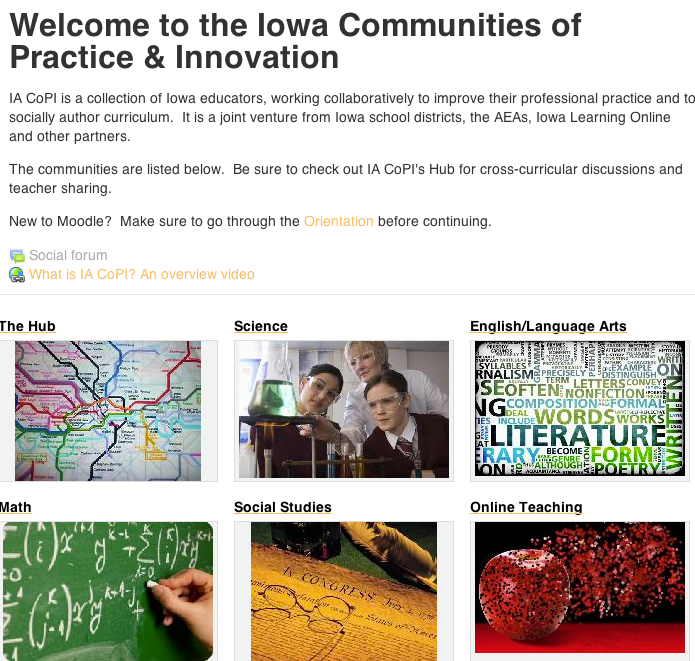 In November we introduced Iowa’s Community of Practice and Innovation (CoPI). To learn more click here. Who should participate in Iowa’s CoPI? How does participating in Iowa’s CoPI benefit teachers? The benefit of CoPI is that with a community of practice, teachers are no longer isolated within their individual classrooms or separated by the lines of their districts. 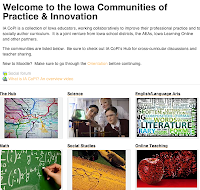 Iowa’s CoPI connects you with educators across Iowa and provides you with structures, opportunities, avenues, mechanisms, and virtual spaces to share, learn, and collaborate in real time to improve student learning with your committed colleagues across the state. If we are all trying to meet the demands of Iowa Core and there is more and more pressure to offer additional digital learning experiences for our students, it would behoove us to work together to accomplish these two increasingly important requirements. Educators leading this CoPI movement work under a motto of “better together,” and believe strongly that students will benefit greatly as a result of the CoPI efforts. How do teachers get involved in Iowa's CoPI? 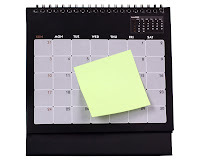 On February 15, 2013 join the conversation here. The CoPI Agora is located on the statewide moodle server. If you do not have an account, the link will take you to a page that will guide you through creating a moodle account. Access online K-12 curriculum or house your own online curriculum here. If you do not have an account with Resource Iowa, go to the site. Once there click on “help” and select “submit a question.” Type “Curriculum Request” in the subject line, complete the form with your request, and submit it. The CoPI participants and steering committees are planning a number of events to showcase our work and highlight what we feel is the power of our “community.” These events are designed to inform and entice interested teachers to become members in our growing movement to leverage the power of social learning and social authoring to meet the demands of teaching in a highly connected, highly demanding classroom. On March 28, 2013 sites around the state will be hosting An Invitation to CoPI meeting that will include information on how to become involved in CoPI. Many teachers and administrators have heard about CoPI and have asked for more information. This is your opportunity to learn if CoPI is right for you! More details and site information will be shared on this blog in February. We have found that learning together provides us with a common understanding and the mutual respect needed in order to better accomplish our goals of creating quality curriculum and instruction. With this in mind, we are in the process of creating a series of seminars that will engage our community in what they want to learn most. Our seminars will be topical and timely, and will offer our members some of that just-in-time learning necessary to keep up with Iowa/Common Core and the changing demands of 21st century teaching and learning. Summer is a busy time, but we found that it is the best time to spend a couple of days focused on digging into the detailed work of curriculum development and redesign. Members of the community meet together to review the work that has been done, access its effectiveness, determine where continuous improvement is needed, and set the course for additional unit/course development. All of this is done in the spirit of shared learning, shared respect, and the shared pleasure of getting together with people you have come to admire, respect, and enjoy through your association with the Iowa CoPI. 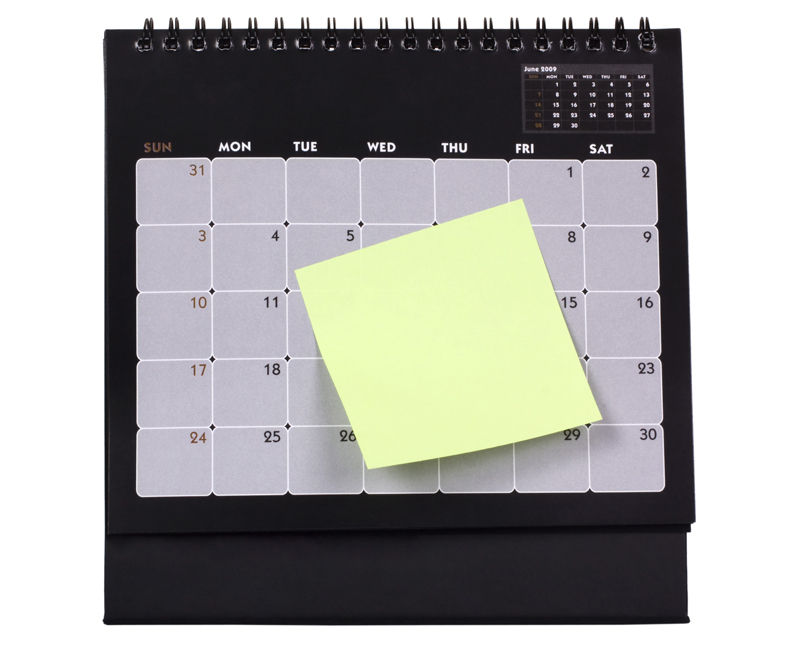 Tentative dates for the 2013 Summer Session are June 3-4, 2013. Bridgette Wagoner has been an Iowa educator for 14 years and is currently the Director of Educational Services for the Waverly-Shell Rock School District. Below Bridgette shares her views on how the CoPI can make a difference for Iowa’s students. The winds of change are blowing throughout Iowa’s educational system. Everyone seems to agree on the need for change, but neither the scope of change nor the pathway to change is clearly defined. From my vantage point, I can see that we’ve come about as far as we can by tinkering with the old system. What stands between us and the next phases of our transformations is a series of lines and boxes. It’s time to break down the lines that separate schools and districts. It’s time to break out of the boxes of our classrooms and our textbooks. It’s time to dissolve the line that separates teachers and students from decision-makers and power-players. The Iowa Communities of Practice and Innovation efforts -- better known as Iowa’s CoPI -- is doing these things. ● Through a community of practice, teachers are no longer isolated within the boxes of their classrooms or separated by the lines of their districts. They can share, learn, and collaborate in real time to improve student learning with their committed colleagues across the state. ● With the acquisition of open source and digital content, the textbook that traditionally defined our courses is gone. Teachers have the immediate power to change the content that is the vehicle to essential learning. The online format frees students from the boxes of their own classrooms to engage and interact with other learners throughout the state. ● Because it is rooted in the values of project-based learning, we’ve begun to blur the lines between content areas and see through the walls of the school buildings to connect important core area learning with real-life contexts. The real value of the CoPI project is in the lines it is blurring and the boxes it is breaking down throughout the state of Iowa. Iowa is full of excellent teachers and leaders who have been standing, toes over the line, pushing against the box by themselves for too long. The power is in the community that has proven its ability to break down boxes and blur the lines that have kept us from transforming the system for far too long.